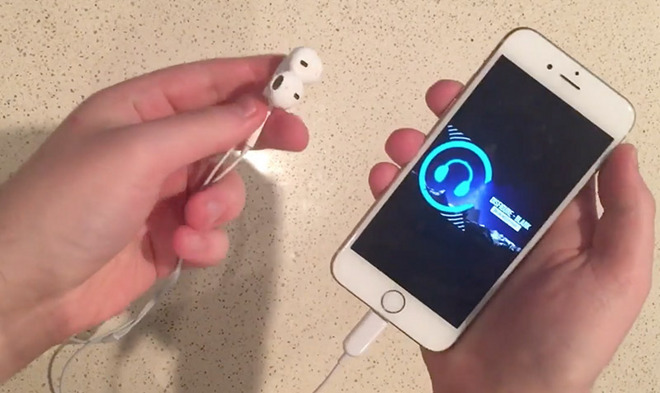 Fanning the flames of rumors claiming Apple plans to remove the 3.5mm headphone jack from its next-generation iPhone, a video posted to YouTube on Friday shows off what appears to be a pair of functional Lightning-only EarPods leaked from Chinese parts suppliers. Like other recent parts leaks, including fresh photos published today, the headphones featured in EverythingApplesPro's video look identical to current EarPods iterations. Instead of terminating in the usual 3.5mm TRRS plug, however, this new version sports Apple's proprietary Lightning connector. In the minute-long showcase, an unseen narrator is seen plugging the supposed future EarPods model into an iPhone running some flavor of iOS 9. He plays a music track from YouTube and proceeds to demonstrate that the multi-function remote control is operable, in this case managing pause/play and volume settings. The remote's microphone was not tested. While the video bears the title "iPhone 7 EarPods," it offers no evidence to support claims that Apple will in fact bundle the headphones with an upcoming iPhone model. Indeed, aside from a design shared with current EarPods, the short clip contains no clues suggesting the device is a legitimate Apple product. That being said, Apple is widely expected to debut a next-generation iPhone with updated internals this fall, the most contentious change being a switch away from the ubiquitous 3.5mm headphone jack format hinted at in supply chain rumors and a multitude of parts leaks.